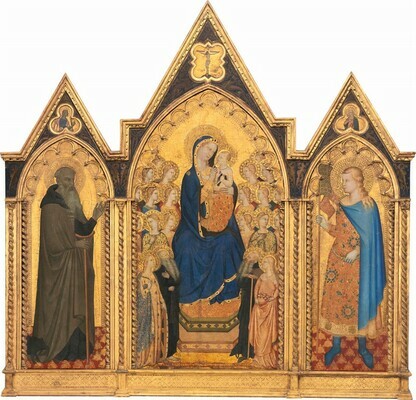 Miklós Boskovits (1935–2011), “Puccio di Simone, Allegretto Nuzi/Madonna and Child Enthroned with Four Saints and Eighteen Angels [middle panel]/1354,” Italian Paintings of the Thirteenth and Fourteenth Centuries, NGA Online Editions, https://purl.org/nga/collection/artobject/7 (accessed April 18, 2019). The creation of works of art during the late Middle Ages and early Renaissance was often a collaborative process. 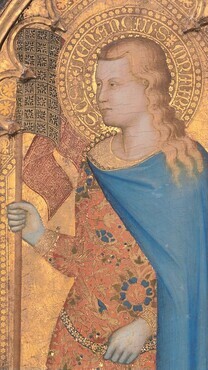 The partnership of the two artists here—Puccio di Simone (Florentine, active c. 1330 - 1360) painted the center and right-hand panel of this tryptych and Allegretto Nuzi (Umbrian, active from c. 1340; died 1373) the left—is a bit unusual, since they were not based in the same city. Allegretto was from Fabriano in the Marches region along the Adriatic coast. Puccio was regarded among the best artists in Florence—perhaps that is why he was called in to help with this altarpiece that was made for a church in Allegretto’s hometown. The church was dedicated to Saint Anthony Abbot, who appears here twice, in the left-hand wing and again as one of the four saints gathered with the angels at the throne of the Virgin and Child. It is not difficult to see the difference in style between the two painters. Allegretto’s Anthony is serious—even the colors are sober. Puccio, on the other hand, has a sunnier palette. Notice how Mary, who, per tradition, points to her son as the way of salvation, also seems to be chucking his plump, little chin. Bernard Berenson, “Prime opere di Allegretto Nuzi,” Bollettino d’arte (1922): 296–309; Bernard Berenson, Studies in Medieval Painting(New Haven, 1930), 63–73; Osvald Sirén, “Three Early Florentine Trecento Pictures,” The Burlington Magazine for Connoisseurs 45 (1924): 285; Luigi Serra, Le gallerie comunali delle Marche (Rome, 1925), 132; Luigi Serra, “L’arte nelle Marche: La pittura gotica; La scuola fabrianese,” Rassegna marchigiana 6 (1927–1928): 128, 130, 136, 138, 146; Luigi Serra, L’arte nelle Marche, vol. 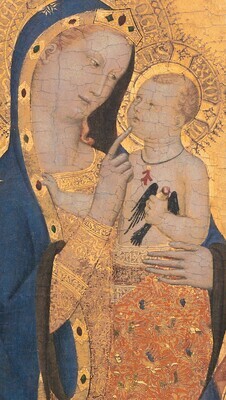 1, Dalle origini cristiane alla fine del gotico (Pesaro, 1929), 280–281, 286–288, 293; Bruno Molajoli, “La scuola pittorica fabrianese,” Gentile da Fabriano: Bollettino mensile per la quinta commemorazione centenaria a cura della Società Fabrianese per la Tutela del Patrimonio Artistico ed Archeologico 1 (1928): 16; Roger Fry, “Mr Berenson on Medieval Painting,” The Burlington Magazine for Connoisseurs 58, no. 338 (1931): 245; Lionello Venturi, Pitture italiane in America (Milan, 1931), no. 87; Lionello Venturi, Italian Paintings in America, trans. Countess Vanden Heuvel and Charles Marriott, 3 vols. (New York and Milan, 1933), 1: no. 107; Umberto Gnoli, “Nuzi, Allegretto,” in Enciclopedia italiana di scienze, lettere ed arti, ed. Istituto Giovanni Treccani, 36 vols. (Milan, 1935), 25:86; Luigi Coletti, I Primitivi, vol. 2, I senesi e i giotteschi (Novara, 1946), xlix; Ugo Galetti and Ettore Camesasca, Enciclopedia della pittura italiana, 3 vols. (Milan, 1951), 3:1779; Pietro Toesca, Il Trecento. Storia dell’arte classica e italiana 3; Storia dell’arte italiana 2 (Turin, 1951), 677; Robert Lehman, The Philip Lehman Collection, New York (Paris, 1928), no. 67. Fern Rusk Shapley, Catalogue of the Italian Paintings, 2 vols., Washington, DC, 1979: 1:383, read HS.XRO. [LUX] M[VNDI]. Presumably the first letters were intended to be IHS, the frequently used traditional abbreviation of the name of Jesus, formed, at least partially, of the letters of the Greek version of the name: ΙΗΣΟΥΣ. The second group of letters is again an incorrect transcription of the letters of the word Christus in Greek: ΧΡΙСΤΟС; see Hans Feldbusch, “Christusmonogramm,” in Reallexikon zur deutschen Kunstgeschichte, edited by Otto Schmitt and Zentralinstitut für Kunstgeschichte München, 10 vols., Stuttgart, 1937-2003: 3(1954):707-720. The meaning of the final letter M, which might be an abbreviation of various words, is difficult to interpret. Probably commissioned for the high altar of the demolished church of Sant’Antonio Abate fuori Porta Pisana, Fabriano; apparently by the early years of the nineteenth century it was no longer in this church, presumably having passed into a local private collection. Joseph Russell Bailey [1840-1906], 1st Baron Glanusk, Glanusk Park, Breconshire, Wales; by inheritance to his son, Joseph Henry Russell Bailey [1864-1928], 2nd Baron Glanusk, Glanusk Park; sold in 1915. (sale, Sotheby’s, London, 25 July 1916, no. 137, as Attributed to Allegretto Nuzi); purchased by Walter Dowdeswell for (Duveen Brothers, Inc., London, New York, and Paris); Carl W. Hamilton [1886-1967], New York, in the early 1920s; (Duveen Brothers, Inc., London, New York, and Paris), by 1929; sold 15 December 1936 to The A.W. Mellon Educational and Charitable Trust, Pittsburgh; gift 1937 to NGA. Walter Dowdeswell was the agent for Duveen Brothers at this time (see Edward Fowles, Memories of Duveen Brothers, London, 1976: 64, and passim). The Duveen Brothers “X-Book” entry for the triptych (the painting was X 170) begins with “Purchased from Sotheby’s 25/7/1916” (Duveen Brothers Records, accession number 960015, Research Library, Getty Research Institute, Los Angeles: reel 422; see also reel 45, box 133, folder 5; copies in NGA curatorial files). A copy of the sale catalogue in the Frick Art Reference Library, New York (copy in NGA curatorial files), is annotated with Dowdeswell’s name as the buyer. The “American oil millionaire” Carl W. Hamilton decided in c. 1920 to furnish his New York apartment with works of art furnished by the Duveen Brothers; a few years later, however, he returned most of his collection to Duveen (see Fowles 1976, 98-99, 127-130; Maryle Secrest, Duveen. A Life in Art, New York, 2004: 181-184, 368). Joseph Duveen, head of the firm, had the triptych again by at least 19 January 1929, when he responded to a letter originally sent to the Metropolitan Museum of Art and then on to Hamilton, stating, “The correspondence has been sent to me because Mr. Hamilton no longer possesses the Triptych, which is now in my private collection . . .” (Duveen Brothers Records, reel 125, box 270, folder 3). Berenson, Bernard. "Prime opere di Allegretto Nuzi." Bollettino d’arte (1922): 296 (repro. ), 297-309, repro. 300. Berenson, Bernard. Studies in Medieval Painting. New Haven, 1930: 63-73, figs. 51, 52. Duveen Brothers. Duveen Pictures in Public Collections of America. New York, 1941: nos. 21-22, repro., as by Alegretto Nuzi. Longhi, Roberto. "Qualità e industria in Taddeo Gaddi ed altri." Paragone 10, no. 111 (1959): 9-10, fig. 12a. 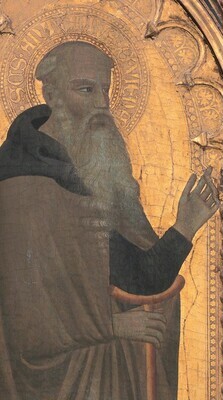 Zampetti, Pietro. Pittura nelle Marche, vol. 1, dalle origini al primo Rinascimento. Florence, 1988: 120. It is Roberto Longhi who proposed that the naturalistic approach exemplified by the figures in the Gallery triptych reflects models disseminated by Giovanni da Milano during his activity in Florence. Roberto Longhi, “Qualità e industria in Taddeo Gaddi ed altri,”Paragone 10, no. 111 (1959): 9–10; Roberto Longhi, “Una ‘riconsiderazione’ dei primitivi italiani a Londra,” Paragone 16 (1965): 13. The proposal has been repeated in various more recent contributions: Carlo Volpe, “Il lungo percorso del ‘dipingere dolcissimo e tanto unito,’” in Storia dell’arte italiana, vol. 2, Dal Medioevo al Novecento, pt. 1, Dal Medioevo al Quattrocento, ed. Federico Zeri, Giulio Bollati, and Paolo Fossati (Turin, 1983), 281 n. 30, 299; Silvia Giorgi, in Galleria Nazionale di Parma, vol. 1, Catalogo delle opere dall’antico al Cinquecento, ed. Lucia Fornari Schianchi (Milan, 1997), 47.